My first rhino t-shirt design finally hit the market. I'm not sure if its sold outside of NY just yet but I saw it in Macy's the other day and also found it at Dr.Jays. This was my second freelance project for Ecko before I got put on staff. I worked on this shirt about a year ago. 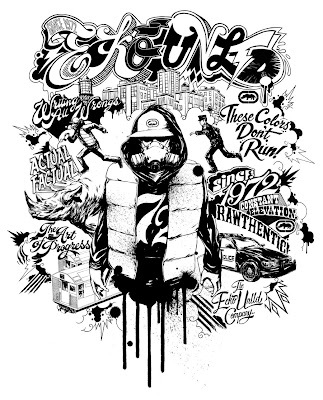 The assignment for the shirt was to draw an image using Ecko related elements (Graff, Hip Hop, City, Rhinos, etc). The finished image had to be one color. 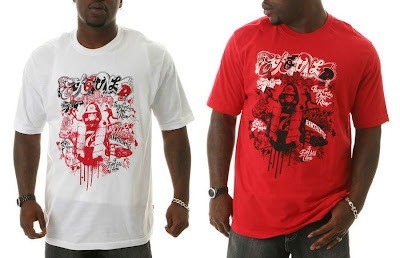 I had creative freedom but within working with the Ecko elements. This is what came of it. I drew all the images and all the text treatment were done by my fellow coworkerAD/friend Raff. Anyone interested in cop'n a shirt should be able to find it at your local Macy's within the next month or so. Apparel that i've worked on will now be hitting the market every season here on after. I'll be posting the samples as they come out.